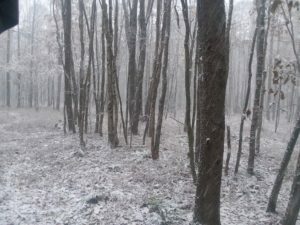 Today is the first real snow of the year. We have had some snow flurries in October but this is the first to really accumulate. The temperature is down in the 20s at night. In a couple days it should be in the teens. 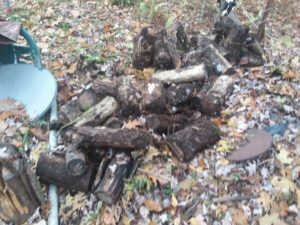 I don’t prepare a huge amount of firewood. There are plenty of downed branches I can access all winter. I do keep a couple weeks worth available. 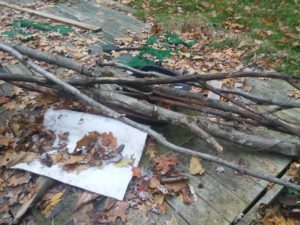 The small branches are easier to cut up with no splitting and burn nice in my small wood stove. 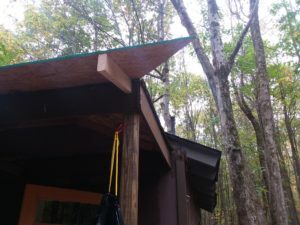 I noticed that as the sun got lower and the leaves fell off the trees more light was getting on the south side of the cabin roof than was getting to the clearing. So I moved the solar panels to the roof. I may angle one more East and the other West to get the best coverage. Another plus is much shorter cables which means more voltage gets to the batteries. Since Lily keeps pulling off her bandages I got her some booties. She walks like something sticky is on her feet. I think she’ll like them in the winter. Her foot is pretty much completely healed. She gets the stitches out Wednesday. Lily runs like a cheetah and leaps like a dolphin. Unfortunately there are some hazards in the woods not even counting the branches and rocks. There are leftover pipes and other metal pieces from long gone oil wells. Anyway, something got her and she cut the web between her toes and part of the pad on her back right foot. It was bleeding pretty bad and looked like just a bandage wouldn’t do, so I took her to the vet. She needed stitches and spent the night there. Amazing how lonely the cabin is for even one night now that I’m used to her being here. 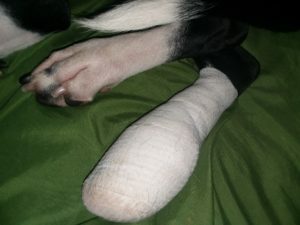 Now her foot is all bandage up. She can walk on it but it doesn’t seem very comfortable. She gets the stitches removed in 2 weeks. The bandage can probably come off in a week if it doesn’t fall off first. 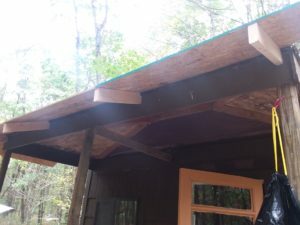 When I built the porch roof I didn’t leave enough overhang. Rain runs onto the porch deck. 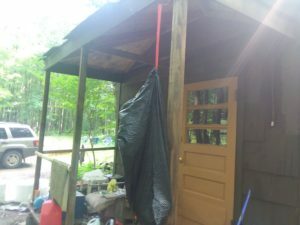 So I am attaching extensions along with tar paper. 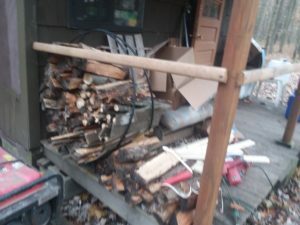 So living exclusively at the cabin has taught me some things. 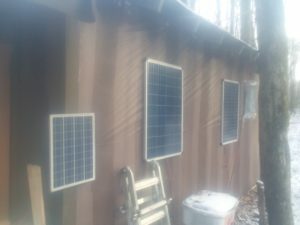 I thought my two 100 watt solar panels and three 75 aH batteries were sufficient. And I still do. But I did run into a problem. I had some problems with my jeep and ran my car battery down. 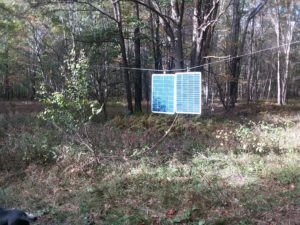 I used my solar charger to charge it but it was rainy for days and didn’t charge very well. I used my deep cycle batteries to start it, then it took a while to recharge them. 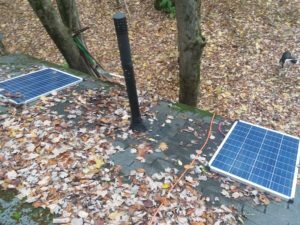 So I decided with the sun lowering in the sky it was time to redesign my solar panel mounts. So I ran an old dog run cable and hung the panels from it. Now they are higher and easy to move along to track the sun. In the photo the line isn’t completely tight yet, so they are actually higher now. It works great! I may design a motor to slowly move them through the day. I did notice last winter that in the winter the reflecting white snow actually makes direct sunlight not as important to get charging voltage. Also I am now shopping for a 12v well pump so I don’t need to use the generator for water. I can then have water pressure maintained automatically. The next step towards indoor plumbing. It begins. I have decided on $200 a month as my monthly cabin budget. Since I still have the house to maintain I am not county those cost as they will go away when I sell the house. 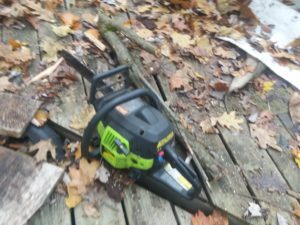 I am allotting just $200 monthly for cabin living expenses. 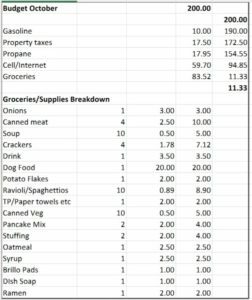 Here is the current budget breakdown. Happy First Day of Fall. And what a perfect day it is. 56 degrees, partly cloudy. I’ve worked outside all day and didn’t sweat a drop.